"Bring me sunshine" is a bouquet inspired by the warm sunny days of summer but for anyone who loves Sunflowers or golden yellow this is bound to make them smile. PLEASE BE AWARE THAT SUNFLOWERS ARE A SEASONAL PRODUCT AND NOT AVAILABLE ALL THE TIME! 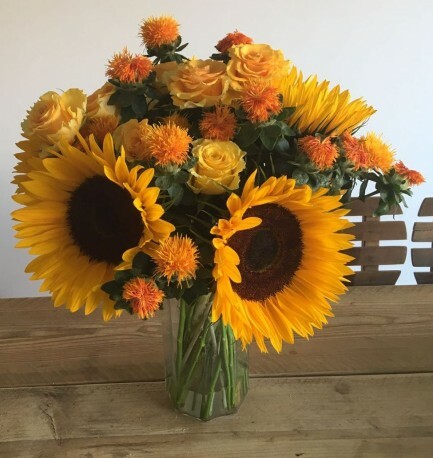 Composed of simple Sunflowers, Golden Sphinx Roses and orange tasselled Carthamus it would look great displayed in a clear glass vase in a modern contemporary home or a large earthenware jug in a more traditional setting. The bouquet in the photograph is the standard size, but for maximum impact go for the De-luxe or Luxury version which has more stems and is even taller. If you wanted to add some fragrance to this gloriuos bouquet then ask us to include some cream Stocks, yellow Freesias or white Oriental Lilies. Your bouquet will be supplied wrapped in brown paper wrap, tied with Raffia but can be delivered in a recyclable glass vase for a small additional fee.